The Vernier Calcium Ion-Selective Electrode is used to measure the concentration of calcium (Ca2+) ions in aqueous samples. The Calcium Ion-Selective Electrode may require a compatible interface and software. Choose a platform below to see compatible interface and software options. The Calcium Ion-Selective Electrode is fully supported with LabQuest 2 (version 2.8.5), a standalone data logger with built-in graphing and analysis software. The software will identify the sensor and load a default data-collection setup. Prepare and calibrate the sensor as described in the Calibration section of this user manual. You are now ready to continue your experiment. Soaking and calibrating the ISE is required prior to using it for data collection. Connect the Calcium ISE to an interface, and connect the interface to your computer. Open Logger Pro. Connect the Calcium ISE to LabQuest. Choose Calibrate from the Sensors menu and select Calibrate Now. Connect the Calcium ISE to an interface, and connect the interface to your Chromebook. Open the Graphical Analysis app. Hold the ISE still until the reading stabilizes and record the displayed reading. Note: With some aqueous samples, especially those at high concentrations, it could take several minutes for the reading of the Calcium ISE to stabilize. If you know the approximate concentrations of your samples, it is best to analyze them from lowest concentration to highest. This reaction and others similar to it produce water with a relatively high concentration of Ca2+ ions, and lesser concentrations of Mg2+ and Fe3+ ions—known as hard water. Many methods of determining water hardness use “total hardness,” or the sum of hardness due to Mg2+ and Ca2+. Since the Ca2+ concentration of freshwater usually exceeds that of Mg2+, determining the Ca2+ concentration alone is a good indicator of water hardness—we will refer to this measurement as “calcium hardness.” For best results, calibrate the Calcium ISE using the 10 mg/L and 1000 mg/L standards. It is important to remember that total hardness, taking into account both the Ca and Mg levels, will be about 1.5 times higher than your calcium hardness value. Water hardness varies considerably in different parts of the United States, from levels of less than 60 mg/L (total hardness as CaCO3) in Washington, Oregon, Louisiana, Mississippi, Tennessee, and New England, to levels exceeding 250 mg/L in Midwestern states (Ohio, Indiana, Illinois, Iowa, Nebraska, South Dakota, and Oklahoma). Water with a hardness as CaCO3 level greater than 120 mg/L is considered to be “hard,” while levels exceeding 180 mg/L are referred to as “very hard.” Total water hardness, the sum of calcium and magnesium hardness in mg/L CaCO3, can be determined by titration with EDTA. A protocol can be found in our lab book Water Quality with Vernier. A plot of ln [Ca2+] (natural log of calcium ion concentration) vs. volume is used to determine the equivalence point. The second derivative can be used to calculate the point of maximum inflection at the equivalence point of the titration. For optimal results at low concentrations of calcium ions, a standard method for taking measurements with the Calcium Ion-Selective Electrode (ISE) is to add ionic strength adjuster (ISA) solution to each of your standard solutions and samples. Adding an ISA ensures that the total ion activity in each solution being measured is nearly equal, regardless of the specific ion concentration. This is especially important when measuring very low concentrations of calcium ions. The ISA contains no ions common to the Calcium ISE itself. Note: The additions of ISA to samples or standards described below do not need to have a high level of accuracy—combining the ISA solution and sample solution counting drops using a disposable Beral pipet works fine. Add the 1.0 M KCl ISA solution (7.46 g KCl / 100 mL solution) to the Ca2+ standard or to the solution being measured, in a ratio of 1 part of ISA (by volume) to 50 parts of total solution (e.g., 1 mL of ISA to 50 mL of total solution, or 2 drops of ISA to 5 mL of total solution). Proper care and storage are important for optimal longevity of your Calcium ISE. Having accurate standard solutions is essential for performing good calibrations. The two standard solutions that were included with your ISE can last a long time if you take care not to contaminate them. At some point, you will need to replenish your supply of standard solutions. Vernier sells 500 mL bottles of Calcium Low Standard, 10 mg/L (order code CA-LST) and Calcium High Standard, 1000 mg/L (order code CA-HST). The Vernier Calcium Ion-Selective Electrode (ISE) is a membrane-based electrode that measures a specific ion (Ca2+) in an aqueous solution. When the membrane of the electrode is in contact with a solution containing the specific ion, a voltage, dependent on the level of that ion in solution, develops at the membrane. The ISE is a combination style electrode. The voltage develops in relation to an internal Ag/AgCl reference electrode. The ISE measures for the specific ion concentration directly. Samples need to be aqueous to avoid contaminating or dissolving the membrane. The Vernier Calcium Ion-Selective Electrode has a solid polymer membrane. The membrane is a porous plastic disk, permeable to the ion exchanger, but impermeable to water. It allows the sensing cell to contact the sample solution and separates the internal filling solution from the sample. 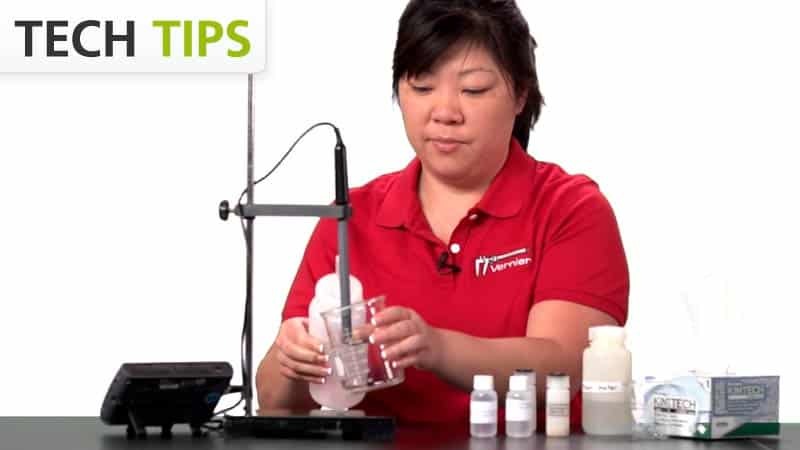 If you have watched the related product video(s), followed the troubleshooting steps, and are still having trouble with your Calcium Ion-Selective Electrode, contact Vernier Technical Support at support@vernier.com or call 888-837-6437. Support specialists will work with you to determine if the unit needs to be sent in for repair. At that time, a Return Merchandise Authorization (RMA) number will be issued and instructions will be communicated on how to return the unit for repair.